Main Street Meats, Chattanooga TN – Marie, Let's Eat! In late August and for much of September, I visited a lot of no-frills places that offered simple and inexpensive burgers. But there are some restaurants around town that offer up a premium patty that will really blow your mind. 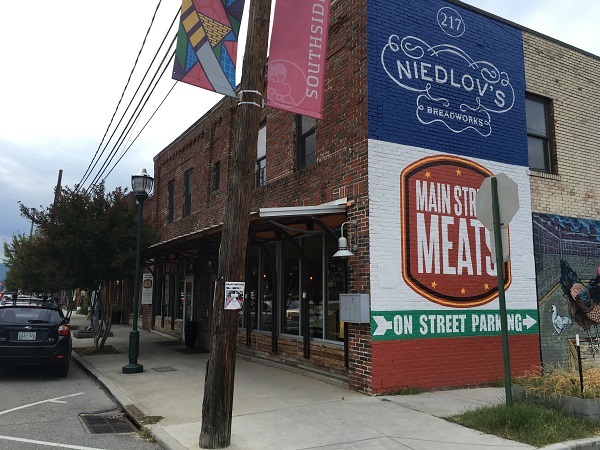 Main Street Meats first opened as a neighborhood butcher shop with a lunch counter in late 2013, but the owners, Jim Johnson, Tom Montague, and Dan Key, felt the space could be used more effectively for a restaurant. A couple of years ago, Johnson told the Times-Free Press “We don’t have the restaurant industry background to be able to do an expansion like this,” and so Erik and Amanda Niel, who have been running restaurants in town for more than a decade, assumed operations of the expanded Main Street Meats. The shop is across from the fire station on Main, next door to Niedlov’s Bakery, and what they serve here is a mighty impressive burger. And some other things, I suppose. 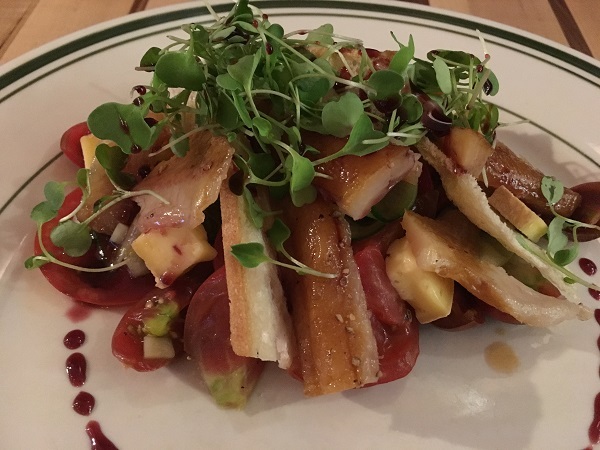 Marie ordered their summer salad with trout. I have no idea why she did something so strange. Oh, she was very pleased and enjoyed her dinner very much, but I don’t quite understand why she’d do that when this burger is available. I didn’t photograph one of our sides. I ordered the pork skins to go along with the fries that my son and I shared. These are enormous and come sprinkled with cayenne and served with a terrific mayo-based sauce. I enjoyed these a lot, although our son complained that the cayenne made them too spicy. But you wanted to know about the burger, I suppose. It’s pretty amazing. 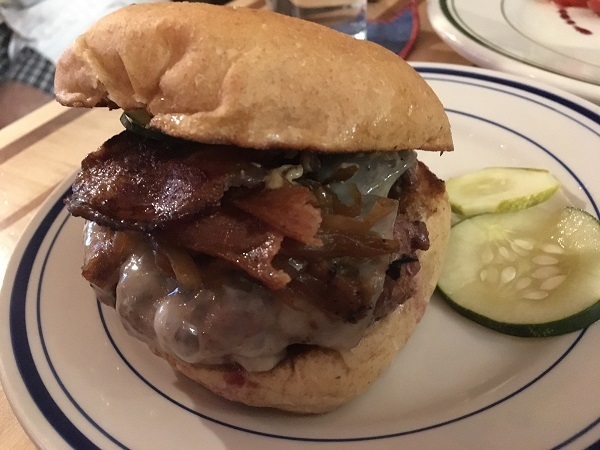 The meat is super juicy, and it comes with pickles, mustard, mayo, bacon, caramelized onions, and Gruyere. If it’s not the best burger in town, it’s definitely a contender. Honestly, I love the no-frills simplicity of Zarzour’s, which is just around the corner, but for a ten dollar burger, this is the sort of thing that should go in a book about this city. So you know why we picked this place? My five year-old son wanted a burger and we felt like splurging someplace nice. He had his with ketchup… and didn’t like it. Ten dollars. Some children, man, some children. Posted on October 31, 2016 by Grant G.Posted in burgers, chattanooga, modern american, tennesseeTagged burgers, chattanooga, modern american, tennessee.